In this chapter I would like to point out one aggravating circumstance in studies on the whereabouts or the transmission of swords, namely the renaming and duplicate and similar entries of certain blades. One such a story starts with Minamoto no Mitsunaka (源満仲, 912-997) whose first name can also be read as Manchū, like it was the case with Yorimitsu. Mitsunaka was searching for a worthy sword but he was not satisfied with the suggested swordsmiths. So he sent one of his men for a swordsmith from the mainland. The Kamakura-period Heike Monogatari (平家物語) reports of an “ironworker from China who lived in a place called Deyama (出山) in the Mikasa district (三笠) of Chikuzen province.” Well, the smith which wasn´t mentioned by name forged several swords but all fell short of Mitsunaka´s expectations and so he was dismissed. Disappointed but being quite confident that he was able to fulfill this task he prayed to the god Hachiman who heared him and gave him iron for the forging of two swords. Several months later the smith was able to present his blades to Mitsunaka. There is another version of this story where the Japanese emperor divided a Táng-period (唐, jap. 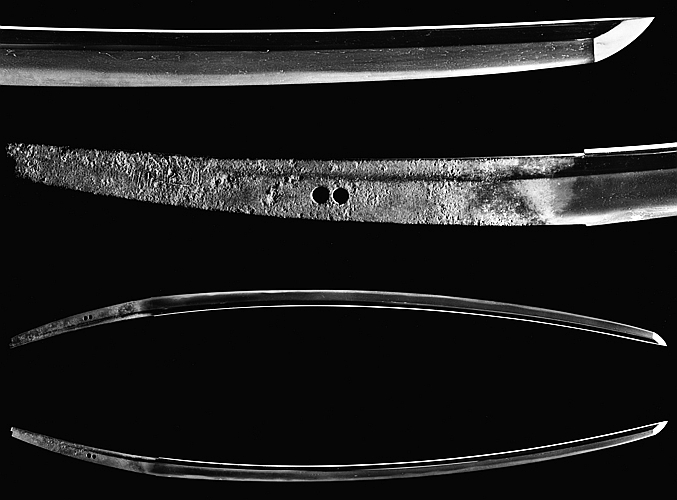 tō or kara, 618-907), almost two and a half meter measuring Chinese lance into two equally sized parts and ordered the two mastersmiths Mōfusa (猛房) from the northern provinces (Ōshū) and Kokaji Munechika (小鍛冶宗近) from Kyōto to make each one sword of it. The problem was that Mōfusa´s finished blade masures three shaku (~ 90,9 cm) but Munechika´s only two shaku and seven sun (~ 81,8 cm). The emperor felt he was cheated by three sun and had Munechika arrested. But he owned now the two blades and selected names for them, once makuragami (枕上, lit. “at the cushion”) for Mōfusa´s “honest” work because he positioned it directly at his cushion, and for the other sun-nashi (寸無, lit. “no/missing sun”) for the work of Kokaji Munechika. Munechika prayed in prison for justice and for a sign of his purity of heart, whereupon the blade of the sun-nashi unsheathed itself and cut-off three sun of the makuragami. Deeply moved the emperor pardoned Munechika and renamed the sun-nashi to tomokiri (友切, about “equal cutter”). From the emperor both blades went into the possession of Mitsunaka who performed a cutting test with them. The tomokiri severed the neck of the delinquent so fast that even the beard was severed too and so he called it thereupon higekiri (髭切, lit. “beard cutter”). The makuragami cutted from the neck down to the knee and received so the name hizamaru (膝丸, about “knee cutter”). *1 Mitsunaka gave both swords to his son Yorimitsu – yes, the same Yorimitsu as in the legend of the Dōjigiri-Yasutsuna – who on the other hand granted the higekiri to his general Watanabe no Tsuna. The following incident happened before the slaying of Shutendōji, when one of his demoniac followers, the so-called Ibarakidōji (茨木童子・茨城童子) terrorized the area around the southern Rashōmon (羅生門) entrance gate to Kyōto. *2 There was already a dispute among Yorimitsu´s shitennō generals about the truthfulness of the stories about the Ibarakidōji and Yorimitsu wanted to put an end to this discussion when he handed-over a lucky charm to Tsuna which he could leave at the Rashōmon when he was so convinced that the demon does not exist. Tsuna agreed and set off alone immediately. Reaching the Rashōmon, Tsuna´s horse shied and he had to went the last meters by foot. At the gate he hung up the lucky charm but realized that the demon was already lying in wait for him at the ceiling. The Ibarakidōji jumped down on him and grabbed his helmet but Tsuna gave the demon a short shrift and cutted off its right arm with his sword. This arm he brought back as evidence to Yorimitsu and his men and on the basis of this incident, the sword was now called onikiri (鬼切, lit. 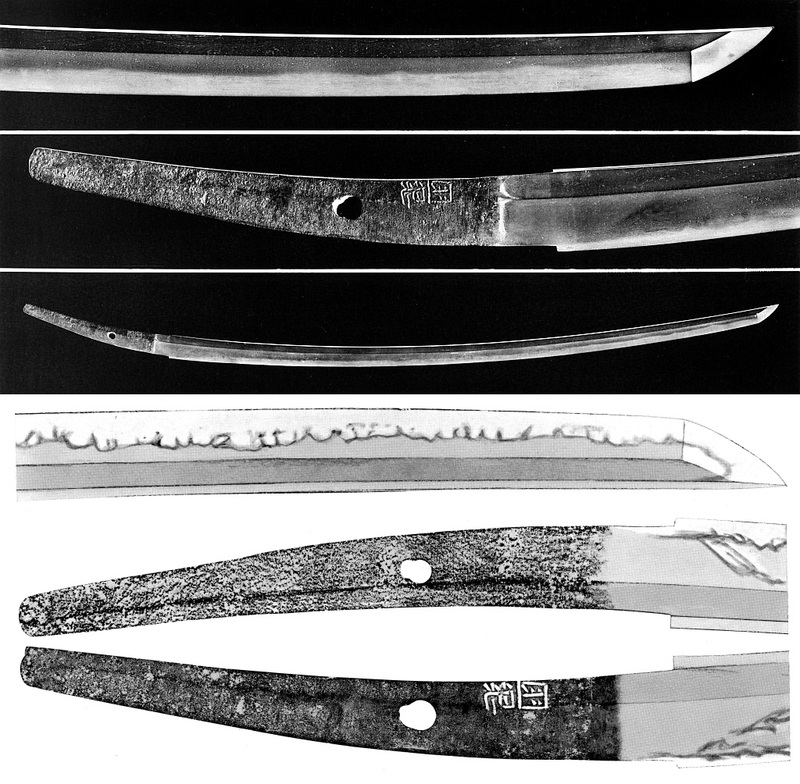 “Demon Cutter”), the name already mentioned in the story on the Dōjigiri-Yasutsuna. After that, Tsuna locked the arm of the demon in a chest and hid it in his house. One day someone knocked on his door and it turned out that it was Tsuna´s old foster aunt. He let her in and hosted here but soon she started to ask him about the chest and the arm. Tsuna declined showing her the demon arm but after a great deal of back and forth and because of the politeness he had to show towards his foster aunt, he agreed and opened the chest. But suddenly the old women turned into the Ibarakidōji, grabbed his arm, and escaping from the scene through the roof of Tsuna´s mansion. When Tameyoshi was in the possession of the famous and for the Minamoto propitious swords, they started to make noise at night. The onikiri roared like a lion and was once again renamed to shishi no ko (獅子ノ子, lit. “lion cub”). The sounds of the kumokiri-mari were similar to a snake and so it got the name hoemaru (吠丸, lit. “howler”). Tameyoshis son-in-law who was chief administrator (bettō, 別当) of Kumano (熊野, a region in Wakayama Prefecture), but he did not distinguish himself as first-rate warrior. But Tameyoshi and other members of the Minamoto family nevertheless agreed that he should receive the sword hoemaru, probably as a broad hint to pull himself together. Additionally, Tameyoshi had him made an exact copy of the shishi no ko which he called kogarasu (小烏, lit. “little crow”) but the latter was two bu (~ 6 mm) longer than the original. Once again a sword – this time the shishi no ko – acted at its own initiative and cutted off the oversize of the kogarasu. This reminded Tameyoshi´s son-in-law of the origins of the two swords and the shishi no ko was again renamed to tomokiri. From Tameyoshi the tomokiri passed over to his oldest son Minamoto no Yoshitomo (源義朝, 1123-1160). Gone were the times of the hayday of the Minamoto in the meanwhile and Yoshitomo complained to Hachiman that he had abandoned the clan although his ancestor Yoshiie bore additionally the name of the deity. Hachiman explained Yoshitomo in a dream that this has something to do with the numerous renamings of the swords which weakened the power of them. Immediately Yoshitomo changed the name of the tomokiri back to higekiri. Somewhat later Yoshitomo´s third son Yoritomo (源頼朝, 1147-1149) received the sword and the son-of-law of Tameyoshi, who realized that he was still unworthy to carry such a sword, returned the hoemaru to Minamoto no Yoshitsune (源義経, 1159-1189), Yoshitomo´s ninth son. He had not learnt anything from the story above and renamed the hoemaru to usu-midori (薄緑, lit. “light green”) because it reminded him of the beautifully light green shining mountains of Kumano. After the death of Yoshitsune it came into the possession of his older brother Yoritomo and so both swords had been reunited again. After the death of Yoritomo at least the onikiri/higekiri remained in Kamakura (the whereabouts of the hizamaru/usumidori are as mentioned unclear), and came so eventually in the possession of Nitta Yoshisada when the latter entered Kamnakura in 1333, overthrowing the bakufu. Further confusing is that he so came at the same time in the possession of the onimaru (鬼丸) called blade by the swordsmith Kunitsuna because this was the same Kunitsuna to which the signature of the onikiri was changed. Once Hōjō Tokiyori (北条時頼, 1227-1263), regent in the name of the Minamoto, invited excellent swordsmiths to Kamakura to have them worked officially for the bakufu. One o them was Kunitsuna who came originally from Kyōto´s Awataguchi school (粟田口). When Tokiyori was one day afflicted by a mysterious “disease” – a small demon appeared every night in his bed-chamber – he dreamt of an old man who said to him: „I am your sword of Kunitsuna. Someone touched me with dirty hands and now I can´t be drawn out of my scabbard because I am so rusty. When you want to get rid off this demon, you should quickly free me from rust.“ Right at the next morning Tokiyori cleaned the blade and stored it at its rack, but as if by magic it fell down, slided out of its scabbard, and cut off a goot of the nearby brazier. This foot was made of silver and shaped like a demon. From that day onwards Tokiyori was never again pestered by the small demon and so he gave the blade the name onimaru. The onimaru became a treasure sword of the Hōjō family. When Takatoki (北条高時, 1303-1333) – a grand-son of Tokiyori – committed seppuku at the capturing of Kamakura by Yoshisada, the sword was taken by the latter. Yoshisada on the other hand suffered a crushing defeat just some years later in the course of the disputes betwen the northern and southern imperial dynasties. According to transmissions he committed suicide in his hopelessly besieged castle Fujishima (藤島城, Echizen province) by cutting off his own head. Whether this story is true or not is open to question but prominently involved in the death of Yoshisada was Shiba Takatsune (斯波高経, 1305-1367). *5 The onikiri was taken by Takatsune and it is assumed that the onimaru of Kunitsuna came over this way in the possession of the Ashikaga family, when Takatsune brought it together with the head of Yoshisada as proof of the death of the latter to Takauji to Kyōto. And now we are at the point where the onikiri made it into the possessions of the Mogami family and became the highly praised heirloom. The subsequent bearer of the sword after Takatsune was his nephew Shiba Kaneyori (斯波兼頼, 1315-1379). *6 Kaneyori was – in the course of the still going on campaigns against the northern provinces of Japan – sent to Dewa and adopted at that time the name of the district where he lived, namely Mogami (最上). To the left the signature of the Onimaru-Kunitsuna, in the middle the signature changed to “Kunitsuna” on the onikiri. Please note the characteristics of the middle signature namely that the second character for tsuna is considerably signed farther to the right as the first character. At the Kunitsuna blade, both characters are in line and of the same size. As comparison to the right, a typical signature of Yasutsuna (here of the Dōjigiri-Yasutsuna). From the Edo period onwards, the onikiri was kept within the Mogami family as onikiri-maru (鬼切丸) but it is rather unlikely that it was tried to establish a connection between the onikiri and the onimaru and that this was the reason why the signature was changed to Kunitsuna. However, it is assumed that at least a certain connection existed between all those swords, the Dōjigiri-Yasutsuna, the onikiri of Yasutsuna from the Minamoto family, and the Onimaru-Kunitsuna. The reader might wonder why we speak in the meanwhile of Yasutsuna or Kunitsuna even when we learned at the beginning of this chapter that the sun-nashi was forged by Kokaji Munechika. But it must be said that from the point of view of workmanship, the onikiri can be without doubt attributed to Yasutsuna. We can only speculate about the maker of the makuragami/hizamari but Mōfusa mentioned in the records is dated in lists of swordsmiths (meikan, 銘鑑) to the Kyūan era (久安, 1145-1151). When we go back to the origins, i.e. the time of Minamoto no Mitsunaka (源満仲, 912-997), the legend of Mōfusa and Kokaji Munechika – the smith of the other sword, the sun-nashi/onikiri – working at the same time on two swords, becomes the more questionable. 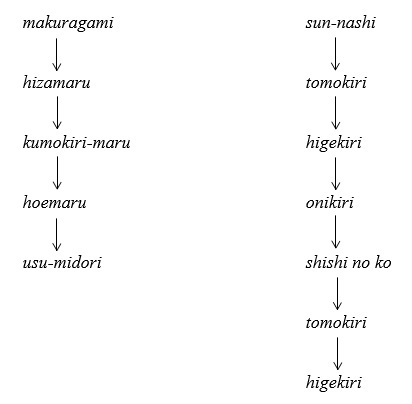 *1 Some sources quote the hizamaru as hizakiri (膝切). *2 Another version of this story takes place at the northern of the Rashōmon situated bridge Ichijō-modoribashi (一条戻橋). *4 Yoshiie´s oldest son and heir died in the Gosannen War (後三年, 1083~1087). *5 The Shiba were a branch of the Ashikaga and Takatsune fought against Nitta Yoshisada on orders from Ashikaga Takauji (足利尊氏, 1305-1358). *6 According to a theory, the sword went first over Takatsune´s brother Shiba Iekane (斯波家兼, 1308-1356) – Kaneyori´s father – to Kaneyori. The theory sais further that Iekane was granted with the sword by Takatsune as a farewell present when he was made governor of the northern provinces (Ōshū-kanrei, 奥州管領 or Ōshū-tandai 奥州探題). After Iekane´s sudden death the sword did not went into the possession of his heir Tadamochi (直持, 1327-1383) but to his second son Kaneyori who was the governor of Dewa (Ushū-tandai, 羽州探題). *7 The exchange of presents in the form of swords was an important ritual throughout the entire Japanese history. So there was the possibility that the Mogami family could have runned into difficulties when it turned out that they presented Hideyoshi at a certain occasion with another sword when everybody knew that he was looking for Yasutsuna blades.